T-shirts are animal magic at Dudley Zoo! 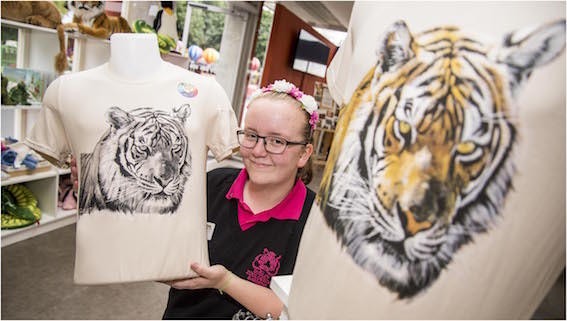 - Wildtex B.V.
T-shirts are animal magic at Dudley Zoo! Get our Magic T-shirts at Dudley Zoo! Fancy some animal magic? Then make sure you get your hands on our fab new t-shirts in the Safari Shop. The new clothing line, which burst into colour in the sunshine, has been flying off the shelves since we introduced it a few weeks ago. Available in adult and children’s sizes, the tops feature a black and white animal picture, with the likes of parrots, meerkats, red pandas, lions and parrots on adult t-shirts and baby gorillas, orang utans, elephants, giraffes and sharks on the younger versions, which once exposed to sunshine come to life in colour, before returning to black and white once out of the light. The children’s t-shirt range in size from 12 months up to 12 – 14 years, while the adult version is available from small up to XXL. STOP PRESS: We’ve also had cotton shopper bags arrive in stock too in the same design! By Wildtex| 2016-07-26T15:04:43+00:00	July 26th, 2016|Wildtex News|Comments Off on T-shirts are animal magic at Dudley Zoo!